Working on a very dynamic environment can be very tiring and tricky most of the times. Consider yourself lucky if you will have a full hour of lunch break and some free time for an afternoon tea. Office environment is really demanding and time consuming that each employees will need to find creative ways to recharge by filling in their grumbling stomach – say eating while working, perhaps? If you are planning to hold a meeting that estimates to consume more than an hour, you should consider serving business meeting lunch delivery that will serve food which is not too heavy to let your listeners doze off after some bite. Lunch deliveries will take care of the menu that is just enough to keep your audience listening with attentive mind until the end of the session. Food like fresh salad with tasty dressings, sandwiches and bagels that will surely fill them in and drinks that will freshen up their moods. Your comrades will not only step out happy, but you are also assured that they have captured the important details of your meeting as they are awake the entire time. Too Busy to Buy Yourself Some Treat? I know that you are busy with your career growth that you do not have any time to bother munching on to something anymore – yes, this could happen and starting to be a normal scenario to those who are working in the office for almost their entire day. But let’s remember that an empty stomach can lead to tired mind and body. Good thing is that lunch delivery will take care of bringing the food for you to enjoy. No need to stop whatever you are doing, or waste your time lining up the queue, or even risking to stain your formal suit because of a muddy road on a rainy afternoon – lunches will now be at your doorstep, waiting for you. We value your time as you value your schedules too. Deliveries will absolutely be exactly what was agreed to and assurance to have only the finest ingredients for your busy physique. Meats, greens and tasty vegetables are picked finely and are made as you order; hence, we are confident that the delights that we bring are freshly cooked. Have Some Fun and Share Some Food! It’s your birthday and you are planning to treat your colleagues during lunch time – uh oh – you only have an hour to eat. No need to dine out as we bring the party in to your office! We offer Party Food Delivery for huge amount of servings made for you and your special guests. Experience a hassle-free party any time that will surely be memorable for you and your guests. In line with our busy lifestyle is the risk to sacrifice our health as we tend to choose work above food and treats. Food deliveries are great aid to this situation – bringing the nutrients that your body need without stopping you reach your goal. 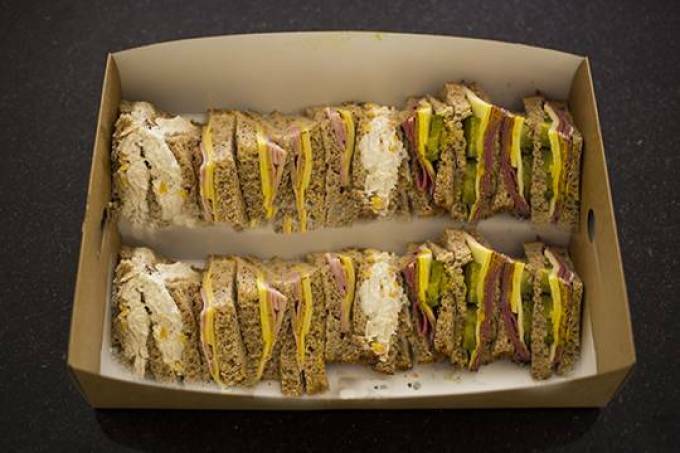 Our Business Meeting Lunch Delivery are perfect for business lunches. They contain the same natural food we sell at Sandwich Platters Delivery.